Boltfish Recordings co-owner Cheju's first solo release for the label. A four track exploration of heavenly electronic sound featuring gentle vocals from Cheju's collaborating vocalist Soo Lee. "... four songs that echo the idm and techno-pop principles of the 90's. Effective ethereal melodies, basses and a clear pop direction. The disc produces precise idm ('Shinchon' and 'Sometimes', this latter at greater speed), spirals of techno pop with the voice of Soo Lee ('Dragon head rock') and finishes with the ambient ('Departure')." "Wil Bolton's Cheju moniker is one to pay attention to. As the Boltfish label co-owner, Wil is not afraid to captivate his audience with highly emotional tracks, paying close attention to the relationship between sound and feeling. With distinctive vocal compliments by Soo Lee, Cheju allows time to casually blur ambient energy and hypnotizing spurts of lyrical beauty; such is the case with "Shinchon," the opening track on this EP. "Dragon Head Rock" manifests pure simplicity as waves of ambience wash away tears of joy. "Sometimes" reaches into the melody bin and punctuates a vibe that runs parallel to Abfahrt Hinwil-styled rhythms. The closing track aptly titled "Departure" is an uplifting ambient entity that tugs at the heartstrings with its Enya enriched layering until it fades away. As The Leaves Turn could easily be the soundtrack to nostalgic memories of times past, but it may also signify the ever changing weather patterns of life as the leaves turn to signal such an event." 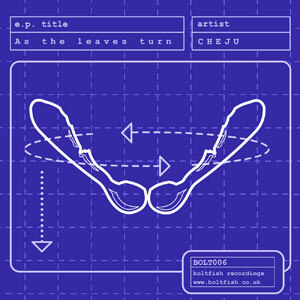 "On this MP3/CDR release from the Boltfish label, Cheju delivers four tracks of well-executed programming, melodic construction and quite a lot of atmosphere. The nostalgic factor is high, so is the production quality, high that is. The opening track "Shinchon" has qualities that any electronic music listener can appreciate. "Dragon head rock" builds along the same lines of thought, but is not as convincing. The third track on the EP "Sometimes" is an excellent track with subbass to go and very apt rhythmic compositions. It grooves in a very compelling way. I would say it was made for the big sound system and I can’t wait to hear it on one. Simply lovely! "Departure" is a virtually beatless track with soaring soundscapes of solitude that also marks the end of the EP in a fitting way. The sixth release is a good effort by Cheju and readily reflects the musical direction of Boltfish Recordings"
"Another EP release from the Boltfish Recordings label which is freely available from their website. The label operates on a not-for-profit basis though you have to wonder how they even meet costs if they’re not actually selling anything. I suppose recording costs must be low given that their output is primarily digitally constructed ambient music, as is the case with this EP from one of the label founder artists Cheju. It’s blissfully chilled with occasional vocals, like a less weird Orb or less pompous Future Sound of London. " "What a lovely sonic gem!" "Joint label owning Cheju, started Boltfish in January of this year as a forum for free online music specialising in experimental, cinematic, organic sounds. Now, not since the days when Warp Records used to send us material have we had the pleasure of reviewing something away from the ‘norm’. Four tracks here to enjoy, and straight away I felt right at home with it. Gentle percussion, and waves of electronica washed over me, soothing my mind and adding a dreamy mood to the office. My personal favourite was ‘Dragon Head Rock’ a vocal track with a sombre mood, but beautifully constructed and allowed to roll around in aquatic oceans of cinematic drama. In fact all the tracks remind me of Two Lone Swordsmen and Boards of Canada at their finest." Buy this release digitally, direct from Boltfish. Digital handling and payments via Bandcamp/Paypal.